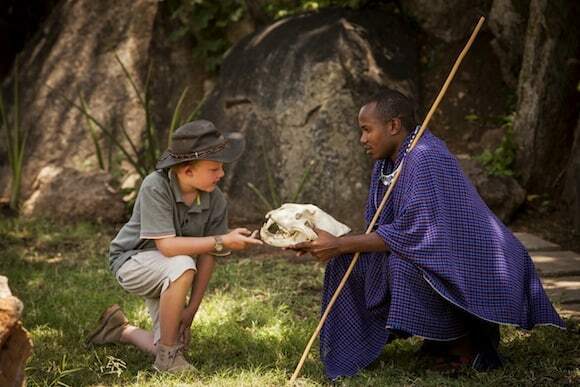 The museum at the Four Seasons Safari Lodge Serengeti welcomes learners of all ages. When Four Seasons Hotels and Resorts took over management last year of a 77-room safari lodge in the center of the Serengeti National Park in East Africa, it wanted to revitalize the property with a sense of place befitting its extraordinary setting. As part of that effort, it opened the Discovery Centre in June 2013, a unique museum within a hotel. In the Masai language, serengeti means endless plains. This is an apt description of the 5700-square mile Serengeti National Park, the oldest and most popular animal wildlife sanctuary in Tanzania. Home to two million wildebeests, hundreds of thousands of gazelles and zebras—as well as threatened species that include black rhinos, elephants, wild dogs and cheetahs—the Serengeti has been designated a UNESCO World Heritage Site. Each May, the park serves as the starting point for the massive annual Great Migration of wildebeest and other species of mammals that begin their long-distance trek north to Kenya. This is the park that inspired the smash Broadway musical, The Lion King. Housed in the great house (main building) of the Four Seasons Safari Lodge Serengeti, the new Discovery Centre features permanent exhibits and a lecture hall, and serves as a base for local conservation research and education initiatives. The displays are self-paced, designed to capture the interest and imagination of visitors of all ages. Scientific information, much of it gleamed from books and journals, has been digested so it is easily understood. For example, one interactive map has a large screen that allows visitors to track the migration month-by-month. Glass cases hold local artifacts showcasing African culture and the lifestyle of Masai tribesmen, including bows and arrows, handmade pottery and beaded jewelry. A large head and neck skeleton of a giraffe seems be peering at visitors from one side of the room. “The new Discovery Centre is not only an educational tool, it is an exciting opportunity to show our guests what an incredibly special and fascinating place the Serengeti is,” says Olie Dreike, who curated the display. Guests can contribute first-hand to ongoing research through the Serengeti Cheetah Project’s identification program, Cheetah Watch. Lectures and tutorials by in-house and visiting experts round out the novel program. For example, U.K. wildlife photographer Will Burrard-Lucas was in residence for two weeks in November 2013. He and his brother created the BeetleCam, a remote-control buggy with a camera mounted on top that captures close-up, ground level photographs of shy and often dangerous animals. The famed photographer, whose work is displayed at the Smithsonian in Washington, D.C., accompanied guests on game drives offering photo tips geared to their varied levels of experience. The contemporary architecture, design and sustainable orientation of the Four Seasons Safari Lodge blend in seamlessly with the surrounding landscape. Elephants and baboons wander on to the watering holes on the grounds. An elevated boardwalk running through the property allows guests views of indigenous flora and fauna. Open-air sundecks on each room encourage “sofa safaris” while relaxing before dinner. It’s not unusual for a baboon to appear on a deck rail. And yes, the green but elegant property offers every creature comfort as well: a fitness center, free-standing spa (with six treatment rooms), multiple restaurants and an infinity pool. Welcoming to children who are mature enough to appreciate the experience but understand the potential risks of the wild, the Lodge is a perfect choice for families, intergenerational groups, and any lifelong learner. This post was previously published by FlightNetwork.com. I’m all in for a safari with a 5 star hotel waiting for me at the end of the day, Irene. The hotel was the icing on the cake~! What a great and unique idea the Four Seasons came up with! Knowing their hotels and resorts, the museum is no doubt superb. Yes, it’s obvious that a great deal of research went into establishing the museum. The setting is a knock-out too. This property, with its museum and wonderful amenities sounds like my kind of place! Trust Four Seasons to do it just right! The hotel covers all the bases: luxury in an authentic setting. The museum is a true asset. Because of all it offers, it makes a terrific base for families. I have yet to go on a safari, but it does keep getting pushed up the bucket list every time I see a plush trip like this – just maybe one of the days, it will happen. Oh dear – I better take my spare change to that coin counting machine at the supermarket so I can get the money together to go here! It sounds lovely. Four Seasons really knows how to do it right wherever they go. How cool that this was the inspiration for The Lion King. Wow, I’m out of the loop when it comes to Africa – I didn’t know that the Serengeti has been designated a UNESCO World Heritage Site or that it was the inspiration for the Lion King! I’m glad it’s being preserved and that its incredible diversity is being showcased in a brand new Discovery Centre. I hope you’ll have the opportunity to visit the Serengeti. You would love it! The Serengeti by day and Four Seasons by night? Count me in! Yes, Patti, definitely the perfect mix! I love safaris, and someday want to return to the Serengeti. Four Seasons? I could probably handle it! I just want to see a baboon appear on my deck rail! Seriously though, your beautiful trip looks like a dream. Thanks for this lovely account. I am so wanting to visit the Serengeti again and stay in this hotel. I visited Tanzania on a humanitarian trip and stayed in hostels and guest houses. I paid a lot for the trip because I was with a former lead National Geographic photographer. It was a very difficult experience for me! I’m starting to plan an African safari for next year and this sounds like a great place to stay in the middle of the Serengeti.